PowerBook, iBook, MacBook, and other portable computing is covered in The 'Book Review. PR: Apple has introduced a new $899 configuration of the 17" iMac designed specifically for education customers featuring a 1.83 GHz Intel Core Duo processor, a built-in iSight video camera, and iLife '06, the next generation of Apple's award-winning suite of digital lifestyle applications. The 17" iMac for education is available immediately and will replace the eMac, Apple's last CRT based computer, providing students and teachers everything they need to learn and create in today's digital classroom, all in the ultra-efficient iMac design. The ultimate in design simplicity, the iMac is ideal for the space saving needs of both the classroom and the dorm room with the entire computer built right into a two-inch thin display. The iMac design has continuously improved generation after generation, resulting in increased material efficiency, decreased packaging mass and volume, and decreased energy consumption - all of which lead to a smaller environmental footprint. Featuring a 17" widescreen LCD display, the iMac for education includes a Combo drive for burning CDs and reading DVDs, 512 MB of 667 MHz DDR2 SDRAM memory expandable up to 2 GB and hard drive storage capacity up to 160 GB. Every iMac also includes a built-in iSight video camera for video conferencing out-of-the-box using Apple's award-winning iChat AV, or recording a video podcast or iMovie® using iLife '06. Providing the latest in high-performance connectivity options, the 17" iMac for education includes built-in 10/100/1000 BASE-T Gigabit Ethernet for high-speed networking, built-in AirPort Extreme 802.11g WiFi for up to 54 Mbps fast wireless networking*, a total of five USB ports (three USB 2.0) and two FireWire 400 ports. Designed with today's digital classroom in mind, every iMac comes with iLife '06, the next generation of Apple's award-winning suite of digital lifestyle applications featuring iPhoto, iMovie HD, iDVD, GarageBand and iWeb, a new iLife application that makes it super-easy to create amazing websites with photos, blogs and Podcasts and publish them on .mac for viewing by anyone on the Internet with just a single click. Every iMac also comes with the latest release of the world's most advanced operating system, Mac OS X version 10.4.6 "Tiger" including Safari, Mail, iCal, iChat AV, Front Row and Photo Booth, running natively on the Intel-based desktop. The 17" iMac for education is available immediately for education customers through the Apple Store for Education or by calling an Apple education sales representative at 800-800-APPL. The eMac will no longer be in production and is available for purchase while supplies last through the Apple Store for Education or by calling an Apple education sales representative at 800-800-APPL. Apple will showcase the 17" iMac and its complete line of products and solutions for education at the National Educational Computing Conference in San Diego, California from July 5-7, 2006. Build-to-order options and accessories include up to 2 GB DDR2 SDRAM, 160 GB Serial ATA hard drive, iWork™ '06 (preinstalled), Apple Remote and Apple USB Modem. *AirPort Extreme uses the IEEE 802.11g wireless standard. Actual speed will vary based on range from the base station, environmental conditions and other factors. "I've gotten Mac OS 9.0.4 up and working on an Intel Mac, running off of SheepShaver. I can get out to the Internet via ethernet or my workplace's wireless network, so it looks like TCP is working fine. I can't see the AppleTalk zones of my workplace though, so all printing looks like it'll need to be set up via LPR. In terms of speed and screen redraw, it's not that swift but it should be fine for a person who just needs to run one or two Mac OS applications. "Installing SheepShaver was fairly easy. I needed a Mac OS 9 CD (9.0, not 9.1 or 9.2.x. ), a copy of a compatible Mac OS ROM (I used MacOS ROM 1.6 from MacOS ROM Update 1.0; use TomeViewer on a PPC Mac to extract the ROM from the installer), sufficient space on my hard drive and a copy of SheepShaver...."
"Ages ago, I found out it would cost nearly what I paid to fix the analog board in my eMac . Over $500 to repair a refurbished machine I only spent $599 on in the first place was folly, so it sat broken on my floor until last week. But what's this? Apple announced a warranty repair extension for the eMac when it shows no video! Since it was a refurb, I couldn't verify against the serial numbers listed on the extension page, so I had to bring it in to the Genius Bar. They told me that my machine didn't fall in the range. Crap. "Later in the day, we're at Sam's Club, and I spot a Samsung 17" monitor for $199, and the plan begins a-brewin'. I'm going to convert the CRT eMac to an LCD, which will allow me to bypass and remove the faulty Analog Board completely. 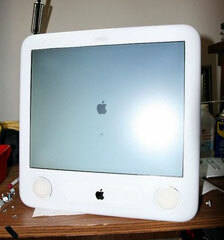 "The eMac is no longer a doorstop, and it only cost my $200 plus a few hours of time. The machine is about 30 pounds lighter, and won't use as much electricity." "The quest to make Mac Prius. A work in progress! Webpage in progress too! "(For the impatient - download a QuickTime video of Front Row being controlled by the Prius's MFD touch screen)"
"The new iMac completes my very small digital Lab. Now multiple digital media experiments begin. I have experienced the interesting phenomena of multiple Apple Remote interesting events. "The Concept of Syncopated multi media Mac's at various levels of media syncopation is an attractive one, to me, and an appropriate topic for me to explore at more depth, within the day to day search for enhanced sound quality at a price also multiple digital media management and display which may well be totally appropriate in a digital interactive home." "Ever fancied the ultra-small form factor of a Mac mini but been put off by its slow processor and inability to natively run Windows? Well, the mini now uses far faster Intel Core CPUs, instead of IBM/Motorola G4s, and can dual-boot between XP and Mac OS X. So, we checked one out to see if there remains any reason why anyone who likes the idea of the mini shouldn't indulge themselves. "There's been something almost sinfully attractive about the Apple Mac mini from the very first version. This is, after all, a complete computer (well, complete except for keyboard, mouse and monitor) that's small enough to fit in a greatcoat pocket and takes up less desktop real estate than a typical mouse mat." iPod Updater 2006-06-28 contains the same software versions as iPod Updater 2006-03-23 for all other iPod models. To learn how to use your iPod with step-by-step instructions and easy-to-follow movies, see the iPod tutorials at: http://www.apple.com/support/ipod/howto/. For more information, visit http://www.apple.com/support/ipod101/. Note: If you aren't sure which iPod you have, and you want to find out if your iPod needs updating, follow the directions below to use iPod Updater 2006-06-28. If the software on your iPod can be updated, the Update button in the updater application will be available. Note: iTunes versions earlier than 6 are supported for music, photo, and podcast syncing only and will not sync videos properly with iPod. Note: iTunes versions earlier than 4.9 are supported for music and photo syncing only and will not sync podcasts properly with iPod. Note: iTunes versions earlier than 4.7.1 are not supported and will not sync music properly with iPod shuffle. *Some computers require either the optional iPod shuffle dock or a USB cable extender (sold separately). Note: iTunes versions earlier than 4.9 are supported for music syncing only and will not sync podcasts properly with iPod. Adobe Photoshop Album 2.0 or iPhoto 4.0.3 or later. PR: ElevenBC is a fully featured computer running both Macintosh OS X and Windows XP operating systems and offers a full array of applications, including Microsoft Office. Delivered in partnership with leading network service providers, this solution delivers a rich, secure and easy-to-use guest experience. Many business travelers and most leisure travelers leave their laptops at home. They hope to find computers in the hotels they patronize. Historically, many hotels have turned to basic Internet kiosks, but these provide only browser-based Internet access. More recently, hotels have set up their own basic desktop computers, placing them in the hotel lobby or business center. Neither of these two approaches has allowed hotels, or their service providers, to deliver complete computer functionality to guests. Nor have these approaches enabled the hotel to properly monetize business center computing and printing. Even some newer systems don't allow hotels to control their brand image and guest experience, let alone centrally manage, control and report on business center use. ElevenBC is a new lobby and business center computer solution developed by Eleven Wireless, an emerging leader of software for managing public-access hospitality broadband networks. ElevenBC offers hotels and their service providers the ability to deploy an elegant all-in-one computer that guests can use to access email, applications and the Internet, as well as print in high-quality color or black-and-white. ElevenBC is the first business center solution that caters to both Windows and Mac users by running both Microsoft Windows XP and Apple Mac OS X. Guests have complete access to Mac Office, Windows Office and other applications on both operating systems and can toggle between the operating systems with a click of the mouse. The guest swipes a credit card to obtain computer access and to print documents. Broadband Internet access is included with purchase. After each session, the system destroys the previous account and delivers a fresh image to the next guest. This helps protect guest privacy while assuring that each guest gets a clean computer image free of viruses and leftover user data. ElevenBC is a turnkey solution that ties into Eleven's on-demand broadband billing software, ElevenOS, thereby enabling centralized reporting, management, troubleshooting and updates. Because of its stylish form factor, ElevenBC can be deployed anywhere, even in the hotel lobby. ElevenBC is based on the Apple iMac and sports a stunning widescreen display certain to attract the interest of guests. The 20" model offers the best in a desktop system, while the 17" model minimizes desktop space without compromising performance. Both the Mac OS X and Windows XP Professional operating systems are available. Users can switch between the two operating systems during a paid session. ElevenBC comes preloaded with standard software applications: Microsoft Office featuring Word, Excel and PowerPoint is available for use with both operating systems. There are even games and other entertainment programs. Included in most ElevenBC configurations is a color laser printer, available for paid use on a per-printed-page basis. A credit card swipe is attached to the computer, and a steel cable and lock are included to secure the full system. ElevenBC is a turnkey solution designed for optimum guest experience. ElevenBC addresses both the functional needs of the business center and the financial needs of the hotel. The combination of competitive third party leasing terms and an attractive revenue share formula enables each ElevenBC hotel to maximize profit and minimize risk. Eleven offers a variety of pricing models that allow for limited risk to the hotel and allow for greater profit from the business center. An Optical Drive Bay Disk Drive mounting assembly that enables four hard disk drives to be mounted in the Optical Drive Bay of the Power Mac G5. A MaxConnect CPU Bay Disk Drive Mounting Assembly that enables installing three hard disk drives in the CPU bay of the Power Mac G5. MaxConnect PCI Bay Hard Disk Mounting Assembly that enables installing two additional hard disk drive in the PCI Bay of the Power Mac G5. With the MaxConnect internal hard drive mounting solution, a Power Mac G5 can house a total of 11 drives internally, which enables the system to boot from one drive and allows other eight drives to be RAIDed (Stripped RAID Level 0) to offer an 8x speed increase in the data transfer rate compared to a Power Mac G5 single drive. Transfer rates in excess of 500 MB/sec sustained can be achieved by striping the hard disk drive using Mac OS X built-in RAID software utility on Power Mac G5 Systems with PCI-X Slots. The MaxConnect internal hard drive mounting solution provides a practical, cost effective, and space saving solution for Power Mac G5 storage expansion without sacrificing the data transfer rate. A total of 19 hard drives (11 drives internally and eight drives externally) can be connected to a Power Mac G5 system, producing more than 18x performance increase in sustained transfer rate. SATA PCI-X Card that adds two, four or eight independent data channels to the G5 Power Macs, each channel can pump up to 60 MB/s of or more data from main storage to the CPU. SATA Data Cables to connect the PCI-X card Data Channels to the disk drives house in CPU or Optical Bay. Power Cables to provide power to the disk drives housed in Optical or CPU Bay. PR: Roadmaster USA Corp. has announced the Roadmaster VR3 Car Stereo (Model VRCD400SDU). Designed to fit easily in your dashboard, the VR3 Car Stereo is a 3-in-one plug n play stereo, featuring an SD card slot, USB port, and Auxiliary Audio Input port for the flexibility to play your entire music collection in your car any way you'd like. 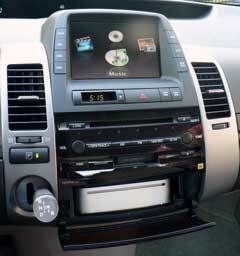 The VR3 Car Stereo plays music saved on many different formats, including downloaded MP3 and non-DRM WMA files, iPods, MP3 Players, DVD Players, and CDs, etc. A remote control is also included for easy navigation. The Roadmaster VR3 car stereo lets you listen to all your MP3 and WMA music saved on your computer, laptop, or MP3 Player while on the road. Just save your music on a USB flash memory key or SD card and plug it directly into the VR3 car stereo; or simply plug your MP3 player, iPod, DVD Player or other device into the Audio Input port of the VR3 for instant music. The VR3 is compatible with ID3 Tag Display, so your MP3 music info (including music titles and artists) will automatically appear on the dashboard when playing. Roadmaster designed the VR3 Car Stereo with all the power of their high-end car stereos. It features 180 watts total maximum power (4x45 watts), 4 x 21 Watt RMS, single din format, and 6.5‰ Full Range Speakers. In addition to MP3, WMA, and iPods, the VR3 also plays traditional CDs and has a built-in AM/FM radio tuner with preset equalization and 30 preset stations with 4 speaker channels. To protect sensitive electronics, the USB slot has an anti-dust cover and built-in electrostatic discharge. And to protect your car stereo from theft, the face plate is easily detachable and re-attachable. Priced at $139, the Roadmaster VR3 Car Stereo Model VRCD400SDU is available immediately through most major superstores, retailers, and car dealerships. PR: Love your car? Get an iPod FM Transmitter & Charger that has a 'nice car' look. MobileTune transmits music from your iPod through your car stereo system, charges your iPod and looks good in your car, all at the same time. Soft leather, chrome details and a glowing, blue dial indicator give a distinctive look while the transmitter offers seamless iPod integration through your car stereo for the ultimate in-car experience. 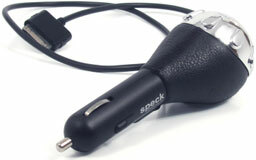 Insert MobileTune iPod FM Transmitter/charger into cigarette/12V power adapter in car. Plug iPod into MobileTune. Tune your radio and the MobileTune to the same station with no programming (dead air or static...). Pick a song and hit PLAY on your iPod! MobileTune will charge and transmit signal at the same time. The cord for iPod to charger acts as a built-in antenna, giving you a stronger, more powerful signal with less static than other FM Transmitters. It's got a self-resetting fuse to keep your iPod safe from power surges. It will pause and power-down your iPod when your car is turned off. MobileTune will charge your iPod faster than most chargers in the market. Clad in soft, genuine leather with a shiny chrome dial, its distinctive look clearly separates it from the pack. Works with iPod video, iPod nano, 4G iPod, and mini iPod. Details that look great in your car. Fits any 12V power socket. Charges and transmits through your iPod. Cord works as a built-in antenna- providing a strong, clear signal for superior audio performance. Shiny chrome tuning knob has a glowing blue dial indicator. Continuous tuning for Frequency Band 88.1 MHz to 107.9 MHz FM. Did we mention it looks great in your car?! No other FM transmitter for iPod was made to have that 'car' look. Shift-knob inspired, wrapped in leather, with a super-shiny chrome tuning knob. Leather wrapped body, chrome face and glowing blue dial accent the look of your nice car interior. Don't have a nice car interior? You will when you plug in a MobileTune. MobileTune iPod FM Transmitter & Charger works with all 5G (video), nano, 4G and mini iPods. It will not work with iPod shuffle, 1st, 2nd or 3rd generation models. Mac of the Day: Power Mac 7100, introduced 1994.03.14. Desktop model has three NuBus slots, enhanced video, 66 MHz PowerPC.